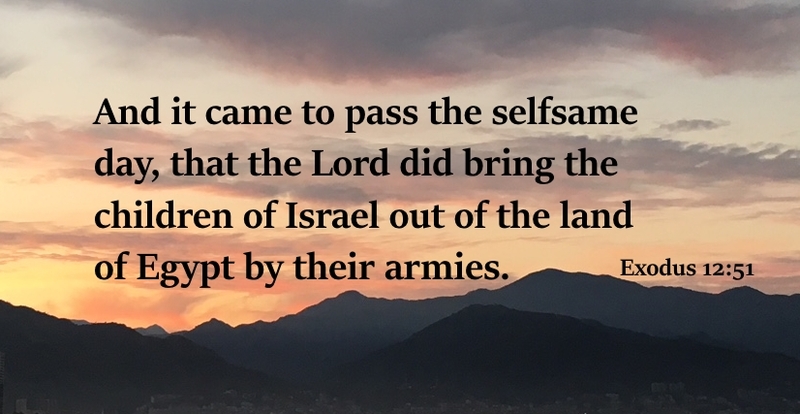 During the forty years of Moses' sojourn in the land of Midian, the Hebrews in Egypt were being gradually prepared for the great national crisis which was approaching. The plagues that successively fell upon the land loosened the bonds by which Pharaoh held them in slavery, and at length he was eager that they should depart. But the Hebrews must now also be ready to go. They were poor; for generations they had laboured for the Egyptians without wages. They asked gifts from their neighbours around them (Exodus. 12:35), and these were readily bestowed. And then, as the first step towards their independent national organization, they observed the feast of the Passover, which was now instituted as a perpetual memorial. The blood of the paschal lamb was duly sprinkled on the door-posts and lintels of all their houses, and they were all within, waiting the next movement in the working out of God's plan. At length the last stroke fell on the land of Egypt. "It came to pass, that at midnight Jehovah smote all the firstborn in the land of Egypt." Pharaoh rose up in the night, and called for Moses and Aaron by night, and said, "Rise up, and get you forth from among my people, both ye and the children of Israel; and go, serve Jehovah, as ye have said. Also take your flocks and your herds, as ye have said, and be gone; and bless me also." Thus was Pharaoh (q.v.) completely humbled and broken down. These words he spoke to Moses and Aaron "seem to gleam through the tears of the humbled king, as he lamented his son snatched from him by so sudden a death, and tremble with a sense of the helplessness which his proud soul at last felt when the avenging hand of God had visited even his palace." From Rameses they journeyed to Succoth (Exodus. 12:37), identified with Tel-el-Maskhuta, about 12 miles west of Ismailia. (See PITHOM .) Their third station was Etham (q.v. ), 13:20, "in the edge of the wilderness," and was probably a little to the west of the modern town of Ismailia, on the Suez Canal. Here they were commanded "to turn and encamp before Pi-hahiroth, between Migdol and the sea", i.e., to change their route from east to due south. The Lord now assumed the direction of their march in the pillar of cloud by day and of fire by night. They were then led along the west shore of the Red Sea till they came to an extensive camping-ground "before Pi-hahiroth," about 40 miles from Etham. This distance from Etham may have taken three days to traverse, for the number of camping-places by no means indicates the number of days spent on the journey: e.g., it took fully a month to travel from Rameses to the wilderness of Sin (Ex. 16:1), yet reference is made to only six camping-places during all that time. The exact spot of their encampment before they crossed the Red Sea cannot be determined. It was probably somewhere near the present site of Suez. From 'Ayun Musa they went on for three days through a part of the barren "wilderness of Shur" (22), called also the "wilderness of Etham" (Num. 33:8; comp. Ex. 13:20), without finding water.On the last of these days they came to Marah (which see), where the "bitter" water was by a miracle made drinkable. Their next camping-place was Elim (which see), where were twelve springs of water and a grove of "threescore and ten" palm trees (Exodus 15:27). After a time the children of Israel "took their journey from Elim," and encamped by the Red Sea (Numbers 33:10), and thence removed to the "wilderness of Sin" (to be distinguished from the wilderness of Zin, Numbers 20:1), where they again encamped. Here, probably the modern el-Markha, the supply of bread they had brought with them out of Egypt failed. They began to "murmur" for want of bread. God "heard their murmurings" and gave them quails and manna, "bread from heaven" (Ex 16:4-36). Moses directed that an omer of manna should be put aside and preserved as a perpetual memorial of God's goodness. They now turned inland, and after three encampments came to the rich and fertile valley of Rephidim, in the Wady Feiran. Here they found no water, and again murmured against Moses. Directed by God, Moses procured a miraculous supply of water from the "rock in Horeb," one of the hills of the Sinai group (Ex 17:1-7); and shortly afterwards the children of Israel here fought their first battle with the Amalekites, whom they smote with the edge of the sword. From the eastern extremity of the Wady Feiran the line of march now probably led through the Wady esh-Sheikh and the Wady Solaf, meeting in the Wady er-Rahah, "the enclosed plain in front of the magnificient cliffs of Ras Sufsafeh." Here they encamped for more than a year (Numbers 1:1; 10:11) before Sinai (which see). The different encampments of the children of Israel, from the time of their leaving Egypt till they reached the Promised Land, are mentioned in Exodus 12:19-37; Numbers 10:21,33, Deuteronomy 1:1-46; 2:1-37; 10:1-22.